Yesterway: Not With a Fizzle, but With a Bang. And so 2012 draws to a close and 2013 emerges with all it's promises of the future. To be honest, this past year has been completely fair to me. I can only hope that 2013 will hold steady at this and perhaps be even better. But then again that is human nature, to strive for consistent improvement. I'm quite excited to share my first goodies of the year with everyone. Although my luck in the thrifts has been lacking, it has given me opportunities to stop in at some antique stores that I don't frequent on a regular basis (primarily due to higher cost). 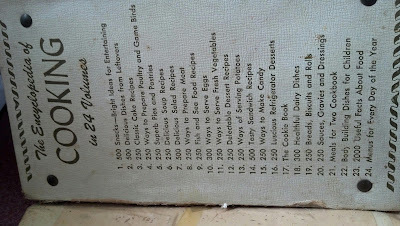 I was still tickled at what I found for (decently) good prices. First up! 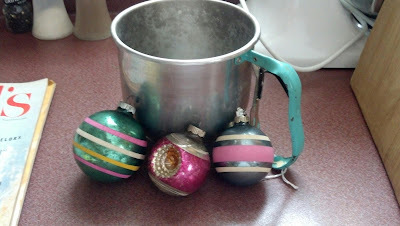 I got the Folley turquoise handled sifter and Shiny Brites all from the same store. My total there was a little less than $10...not quite as awesome as thrift prices...but I got an indent ornament...and this makes me happy. The rest all came from a different antique store that I've had pretty decent luck with. Especially with chairs; I must have gotten 5 chairs from there. I was a little disappointed they hadn't gotten more chairs in, but I still found some goodies. I grabbed these two McCall's magazines from May and September of 1958 for $3 a piece, in excellent condition. 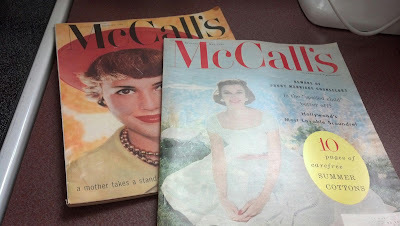 I just loved reading them...they had some amazing advertisements and articles on clothing. I hope do be posting some interior photos from them soon. 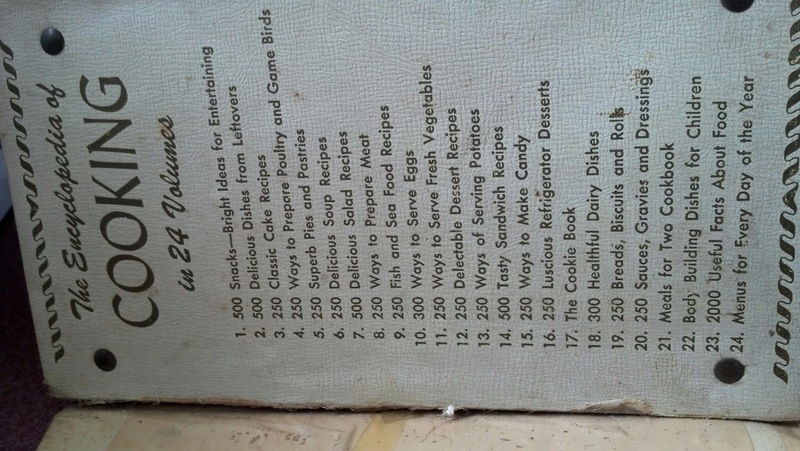 I was also pretty tickled to find this Encyclopedia of Cooking in 24 Volumes Binder. 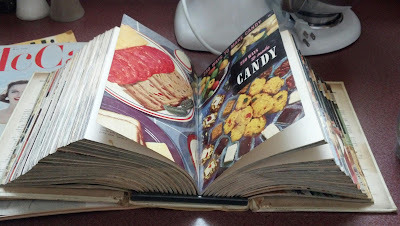 As you have likely gathered....I love the little cute cookbooks. This is like a complete set of them all in a cute little package. And it was only $5...I consider that a score! 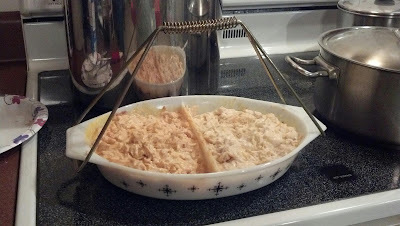 Last but certainly not least we have my new compass divided casserole dish in use! I found out that the divided casseroles are perfect for serving warm dips... For instance, for the new years ever shin dig at my house, I made buffalo chicken dip... the problem is that I like it really spicy and that very few others are in agreement on that. The solution: Half the casserole is spicy, the other half is far more mild. Perfect. Well that's all for now folks! I'm linking up on The Nifty Thrifty at a living space Many great wishes that your upcoming 2013 is wonderful! Happy Thrifting! I love finding old magazines - wish it happened more often. I completely agree Jill, they're like paper time capsules! Nice finds! That huge cooking binder is impressive!